This month I had the privilege of attending a meeting on Mindfulness in Politics, organised by the Mindfulness All-Party Parliamentary Group (MAPPG), at the House of Parliament in London. 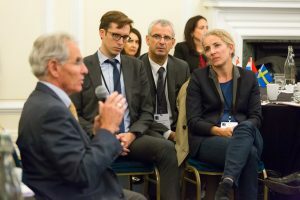 With keynote speaker Dr. Jon Kabat-Zinn, founder of the Mindfulness-based Stress Relief (MBSR) in 1979, the meeting assembled some 50 Europeans working on mindfulness at policy levels in their respective countries. These included France, Sweden, Denmark, Estonia, Iceland, Slovenia and – of course – the United Kingdom. MAPPG was founded four years ago by Welsh MP Chris Ruane, who started by gathering a few of his colleagues from other different parties to join a weekly mindfulness group. 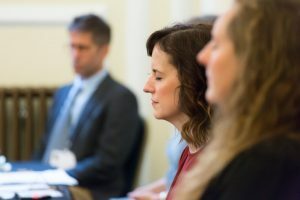 After the individual group members established personal mindfulness practices, the MAPPG, with the help of Oxford University Mindfulness Centre, initiated a major study, ‘The Mindful Nation’, which was presented to the UK government. 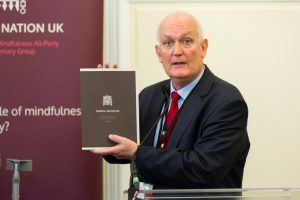 The study led to the development of several mindfulness training programmes in the fields of health care, education and the judicial system across Britain. The fact that the group was comprised of members from all parties in British politics assured fast execution by national agencies. The results are impressive. This group is slowly turning into a global movement – as evidenced by the enthusiasm and energy at the meeting. Mark is one of the people who benefited from a by MAPPG initiated mindfulness programme. He was sent to prison for 26 years for acts of violence, and was released at the beginning of this year. He was then introduces to mindfullness practice. At the request of MAPPG, Mark spoke at the meeting for European parliamentarians to illustrate what mindfulness can mean in practice. ‘I know what it means to be imprisoned. After many years I was released from prison. But when I tried to live a life of freedom, I discovered that my mind was still imprisoned. I was free of the outer prison, but not free of the inner prison of my negative thinking. So I was worried that I would fall back into bad behavior. My rehabilitation officer suggested that I join a course to practice mindfulness. I had never heard of it and had no clue what it was about. But to my surprise, the practice made sense to me. It was only a brief moment of insight, but I could see that it is possible to free your mind of the perpetual cycle of negative thinking.’ Mark paused as tears welled up. I left the meeting inspired and hopeful. Mindfulness is more than a tool for personal stress management and emotional regulation. It is also an attitude towards life that helps us envision new policies and practices in education, health care and prison systems, as we are learning from the UK. It can reshape our societies in a more healthy and compassionate direction. It is my hope that together with you, Mind & Life Europe can support the emergence of a European platform for the dissemination of mindfulness in politics. Please join us in this and share your thoughts and ideas with us at office@mindandlife-europe.org. More information on the Mindfulness initiative in the UK. Fantastic that so many people can benefit.